The conduit is not the controversial and long-delayed Keystone XL Pipeline that TransCanada is still shepherding through the approval process. 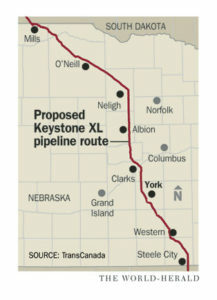 But as NPR’s Jeff Brady reports, the spill comes at a sensitive time for TransCanada. “Regulators in the neighboring state of Nebraska are expected to announce a decision on the company’s proposed Keystone XL pipeline next week. The project and its route through Nebraska have been controversial. Some landowners are concerned about how an oil spill might harm their property and water supplies.” Click here to read more. 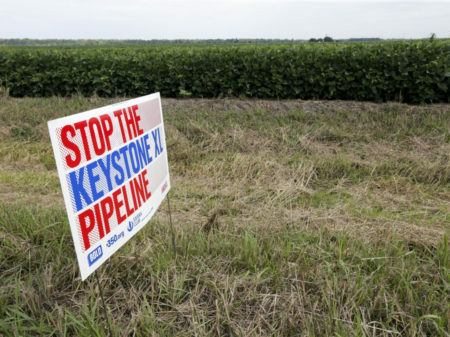 The spill comes just days before a crucial decision next Monday by the Public Service Commission in Nebraska over whether to grant a permit for a new, long-delayed sister pipeline called Keystone XL, which has been mired in controversy for several years. Both are owned by Calgary-based TransCanada. The spill on the first Keystone pipeline is the latest in a series of leaks that critics of the new pipeline say shows that TransCanada should not receive another permit. This entry was posted in Nebraska / Midwest News, NewsBlog and tagged Keystone pipeline, Keystone pipeline's latest in a series of pipeline spills, Keystone XL Pipeline, Nebraska Public Service Commission on November 17, 2017 by Helen Deffenbacher. Nebraska is a conservative state. We appreciate sound and fair business practices. That’s why I oppose the Keystone XL pipeline. It is a bad investment. It is like investing in typewriters in the age of computers. Fossil fuels, like typewriters, are technologies of the past. Renewable energy is the technology of the future . . . Let’s stick with our conservative Nebraska roots and conserve our valuable soil and water to create a booming urban and rural economy with the energy sources that we have in abundance – wind and solar. One-hundred percent renewable energy combined with energy storage is already possible. David E. Corbin is vice chair of the Nebraska Sierra Club and an emeritus professor of public health at the University of Nebraska at Omaha. He also serves on Nebraskans for Solar’s Board of Directors. This entry was posted in Nebraska / Midwest News, NewsBlog and tagged David Corbin, Keystone XL Pipeline, Local View: Lincoln Journal Star, Nebraskans for Solar on August 2, 2017 by Helen Deffenbacher. This entry was posted in Nebraska / Midwest News, NewsBlog and tagged Keystone XL Pipeline, Omaha World Herald, Paul Hammel, tar sands oil, TransCanada's commitment to renewable energy development on July 30, 2017 by Helen Deffenbacher. TransCanada has said it wants commitments for 90 percent of the pipeline’s capacity before it continues building. In February, the falling demand for Canadian oil led ExxonMobil to write off its entire 3.5 billion barrels of estimated reserves in Alberta oil. American shale oil, plus falling prices for solar and wind energy, have caused analysts to predict that oil prices won’t recover anytime soon . . . The pipeline investment must be amortized over 50 years, by which time global warming will be impossible to ignore. Just like the law of supply and demand. This entry was posted in Nebraska / Midwest News, NewsBlog and tagged Columbia Missourian, Keystone XL Pipeline, Nebraskans for Solar, St. Louis Post Dispatch on July 13, 2017 by Helen Deffenbacher. 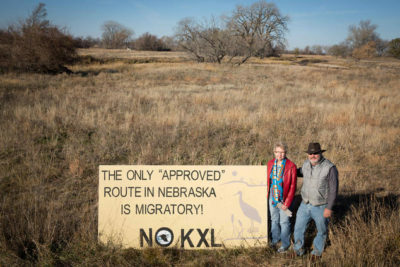 When TransCanada began knocking on doors throughout Nebraska in 2008, most residents didn’t know much about its Keystone XL pipeline or the dirty tar sands oil it would be transporting. 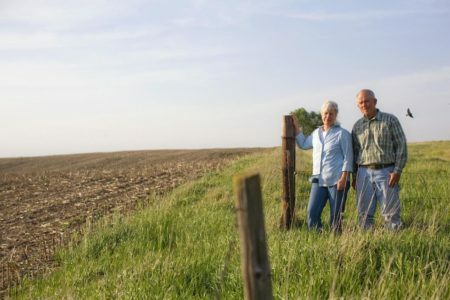 The energy company was negotiating easements with local landowners in order to secure a route for its multibillion-dollar project—which would run north to south through the state, directly through the Ogallala Aquifer and across hundreds of Nebraskan rivers and streams. TransCanada threatened landowners with eminent domain if they didn’t comply. Click here to read their stories. Public comments accepted on a first-come, first-serve basis. Commenters will have three to five minutes to speak. The commission has also scheduled five days of public hearings August 7th through 11th beginning at 9 a.m. each day at Lincoln’s Marriott Cornhusker Hotel, 333 South 13th Street. The commission also provides an online form for the public to submit comments. Eminent Domain – World Premiere of an Omaha Playwright’s Work, Omaha Community Playhouse, August 25, 2017 at 7:30 p.m. Description: On the surface, Eminent Domain exposes the hard-fought battle between Nebraska farmers and corporate energy. Dig deeper and the greater struggle is revealed: the fight to preserve our Heartland’s farms and the livelihood of the people who live here. Our most crucial resource is not just the land we are privileged to attend with cracked and calloused hands—it is our kin, our clan and our heritage. This entry was posted in Nebraska / Midwest News, NewsBlog and tagged Bold Nebraska, EcoWatch, Eminent Domain, Keystone XL Pipeline on June 21, 2017 by Helen Deffenbacher. Keystone XL has always been an economically risky proposition. Tar sands oil is expensive to extract, process, and transport, and the cost of the pipeline is now expected to exceed $8 billion—up from the $5.4 billion the company estimated in 2011. Back then, when crude oil cost $95 per barrel and tar sands production was ramping up, spending that exorbitant sum on a pipeline project might have been financially viable. But in an era of relatively low crude oil prices (today, about $48 per barrel), cheap natural gas, and unprecedented drops in the price of renewable energy, it doesn’t make much sense to bother turning Canadian mud into oil. 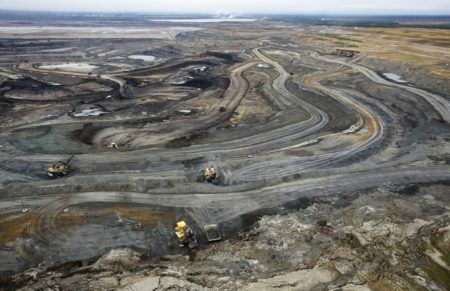 In recent years, fossil fuel companies including Shell, ConocoPhillips, Total, and Statoil have fled the tar sands mines of northern Alberta, canceling projects. This trend poses an existential financial problem for an 830,000-barrel-per-day pipeline that requires a substantial expansion of tar sands production to fill it . . . A recent Quinnipiac University national poll shows public support is dwindling for the project. The Nebraska Public Service Commission has scheduled five days of public hearings August 7th through 11th beginning at 9 a.m. each day at Lincoln’s Marriott Cornhusker Hotel, 333 South 13th Street, to take formal testimony on the proposed Keystone XL pipeline across the state. The commission also has an online form to gather comments. Visit the Omaha Community Playhouse’s website for more information. This entry was posted in Nebraska / Midwest News, NewsBlog and tagged Eminent Domain, Keystone XL Pipeline, Nebraska farmers on June 4, 2017 by Helen Deffenbacher.